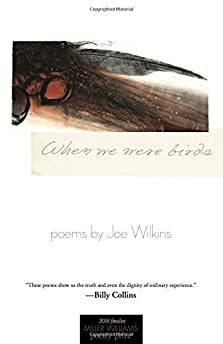 Largehearted Boy: Book Notes - Joe Wilkins "When We Were Birds"
Book Notes - Joe Wilkins "When We Were Birds"
"Full of imaginative novelty as well as reminders that miraculous secrets are hidden in the fabric of everyday life . . . these poems show us the truth and even the dignity of ordinary experience." And then, not long after we heard about the cuts, about the college's debt, about a possible sale—who knew a college could be sold?—we found out that we were pregnant. We had thought that we might leave too. Instead, we hunkered down. Turned inward. We waited for our son. Painted his room. Snowshoed along the Winnebago River. Planted a big, messy vegetable garden. In the summer of 2009 our son was born. He was colicky, demanding. He was everything. A universe. A gravity that had us. There are spans of time—months—where I don't know what I did but walk with him, carry him along the dirt path at the edge of town as he slept. Eighteen months later, we were pregnant again. A daughter this time. Three years ago we moved, thankfully, to western Oregon. Though we feel more at home here, the ferns and rain-drenched forests of the Pacific coast color only the edges of these poems. When We Were Birds is rooted most wholly in the distances of Iowa. "Every love has its landscape," writes Rebecca Solnit. "Thus place, which is always spoken of as though it only counts when you're present, possesses you in its absence." The nine songs I've picked here, I hope, mirror both our sojourn in the Midwest and my struggle to know that experience in the poems of When We Were Birds. No River City – "Way Home Soon"
Before I left for Iowa, a friend gave me a mixed CD as a going-away present. It was a good CD, but "Way Home Soon" didn't stand out until we made it to the Midwest. It took those flat, straight, county-line Iowa roads for No River City to shine. "On the finest night in Iowa," Drew de Man sings, " The clouds slide under the moon / So I roll another cigarette and breathe out my prayer / That I might wind my way home soon." Even then, only weeks and months in, driving those new roads, I think I knew Iowa wasn't—couldn't be—home. Shovels and Rope – "Patience"
I grew up in a small town, a town even smaller than the one we lived in in northern Iowa. And many things—the isolation, the rural poverty, the unspoken codes and expectations, the succor of community—reminded me of my growing up years. But twisted. Not quite the same but close. And this became even more apparent as my son grew into boyhood, as he tried to play with the boys next door—his experiences wildly different and, sometimes, sadly the same as my own. Much like, I think, this haunting rendition of "Patience," Cary Ann Hearst just killing Axl's lines there at the end. Lucinda Williams – "Side of the Road"
When I drive a new road I'm always looking off into the distance, studying some forested slope or draw in the land, thinking, "There. I could live right there." I do the same to the folks I meet and pass by, men sitting out front of gas stations or boys and girls turning hay bales in a field; I wonder my way into their lives, their many stories. It's a way, I think, to try to know a new place, and many of the poems of When We Were Birds re-enact this wonder, this imaginative slide into another place, another life. In song, no one does this better than Lucinda Williams. Though "Side of the Road" is definitely an almost breakup song, it's also about imagination and wonder and re-shaping the self via new visions of the world: "And I wondered about the people who live in it / And I wondered if they were happy and content / Were there children and a man and a wife? / Did she love him and take her hair down at night?" Johnny Cash – "I Hung My Head"
I found myself, as a poet, somewhat adrift in the Midwest. The voice I'd been speaking in—wrapped up in grief and memory and the landscapes of the West—just didn't seem to work. One day I happened on an article in the local paper about a prisoner who'd escaped for a couple of hours from the town jail and was recaptured only a couple of hours later. My morning walk to campus took me right by the jail; I often heard the inmates talking and playing basketball in the yard. I wondered what this man was thinking. I mean, it was February in north Iowa, drifts of snow as high as your shoulder on every corner, the mercury in the single digits most days. I started writing the poem "Leviathan," speaking in that prisoner's voice, trying to understand. That poem quickly led to other poems, other voices. The dramatic monologue has a long tradition in poetry—and in country music. Particularly Cash's varied and devastating confessions. Bob Dylan – "Workingman's Blues #2"
Again, the recession. We made it through with only a few scrapes. But so many of our neighbors didn't. On our block alone—eight houses resting on a small green rise, a rutted alley, great tall buckeyes and oaks, low stone walls along the street—we counted, and hated to be counting, three work furloughs, two lost jobs, one house foreclosure, one suicide. Gordon Lightfoot – "Early Morning Rain"
I say, above, "we were pregnant," by which I mean my wife was pregnant. So, while Liz was doing all the hard work, I was trying to be helpful; I was writing poems. I wrote a whole series addressing our unborn son, telling him about things that I thought were important, things I thought he should know. One evening, Liz so pregnant she had to hold her guitar way out on her, I listened as she strummed and sung Lightfoot's "Early Morning Rain," the vibrations of the guitar and her voice surely rippling the waters within her, around him. The next day, I drafted a poem titled "Note to My Unborn Son Concerning Canadian Folk Music." Gaslight Anthem – "Blue Jeans & White T-Shirts"
There are lots of rock songs about being in love and wishing to be together. There are very few about being together and being in love—and also being new parents. "Blues Jeans & White T-Shirts" isn't about that either, but in its tiredness, its tired acceptance, it always reminds me of that weary, wonderful time. Nanci Griffith – "Listen to the Radio"
You just won't find a sadder, happier leaving song that Nanci Griffith's "Listen to the Radio." I remember, distinctly, crossing the Missouri on our way back west, bright late afternoon light spilling through the windshield, and the jangle of Nanci's guitar spilling from the speakers. I glanced in the rearview, caught my son tapping his little foot to the tune. Old Crow Medicine Show – "Sweet Amarillo"
When We Were Birds becomes, by the end, a meditation on happiness, inheritance, dumb luck, and grace. How to reconcile a neighbor's suicide and the birth of our son? Or our wild, dancing daughter and the stone-faced neighbor girl, the one who tears her dolls apart, whose father was just laid off? How to reckon with my own retreating griefs, the sorrows I know so well fading in the face of this unearned grace? I don't know. But like my son and daughter, toy instruments in hand, I'll sing along as loud as I can: "Sweet Amarillo / Tears on my pillow / You never will know how much I cried / Sweet Amarillo / Like the wind in the willow / Damn this old cowboy for my foolish pride / Swee-ee-eet Amarillo..."
excerpt from the book (the author reading "My Son Asks For The Story About When We Were Birds"